The Chevrolet Volt, will be offered for sale in Germany up against the Opel Ampera for a price of €41,950 (including VAT) in Germany. Similar prices can be expected for other euro markets. European Chevrolet customers will have the same standard eight-year/160,000 km warranty as U.S. customers on the Voltec powertrain and the advanced lithium-ion battery. "We believe Volt is the best solution on the planet today for worry-free electric driving", says Wayne Brannon, President and Managing Director of Chevrolet Europe. "Our price in Europe is based on the U.S. Volt price adjusted for transportation cost, import duties, exchange rates and homologation." Since late 2010, the Volt has been on sale in the first seven U.S. launch markets (California, Connecticut, Michigan, New Jersey, New York, Texas, and Washington, DC). Thanks to the high demand, it was decided to speed up the national rollout so the Volt will be sold in the remaining U.S. states by the end of 2011. 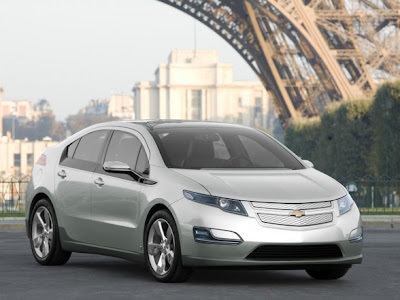 The Volt will reach European Chevrolet showrooms in November of 2011, just in time for Chevrolet’s 100th birthday. Chevrolet plans to produce 10,000 Volts by the end of the 2011 calendar year, and an additional 45,000 Volts during the 2012 calendar year. The Chevrolet Volt is produced at GM’s Detroit Hamtramck plant in Michigan, U.S.A. The state-of-the-art lithium-ion battery is produced at GM’s Brownstone Township plant, also located in Michigan.